A pulled back muscle, an expired ATM card, a chipped filling, the tragic death of a teen in the Reform Jewish community and a little stress in the office, where 20 percent of the staff is to be laid off in the next few weeks all seem to have stolen the muses from my soul this week. 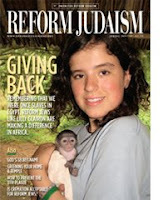 On the good news front, the latest issue of Reform Judaism magazine is hot off the press. Take a browse through...including the new section, “News and Views of Reform Jews,” which includes my first-ever article in the magazine, Action: Blueprints for Green Living.